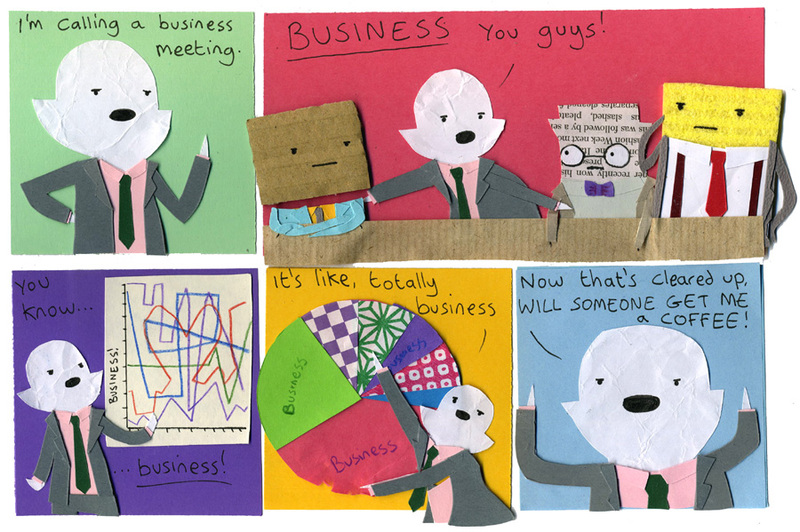 because all business has to be boring, business! The last panel just kills me, I love it. <3 She reminds me of Daisy preparing for her job interview in Spaced. the green line represents a heart beat lol. HAHAHAHAHAHAHA!!! genius! why was there two purple lines………? The panel with the pie chart is just constructed so amazingly. I love this! I love the heart shape line anddd BUSINESS COLIN FTW! Aren’t you glad you’re a comic artist and not Business Philippa? I hear music going on under this, like the opening scene in a musical. Pauline’s business is my favorite business. Aha! So it was Pauline that caused the mini-crash on Wall Street! i spot a heart on the graph. oh man. Who knew she was so serious. I think she’s CONSTIPATED!! And I luv ur little picture battlehobo! I can only comment one thing: BUSINESS. I really adore the 2 panel! And I want some coffee right now too. Business is comprised of two important things: Business and Coffee. Thats awesome. XDDDD Ong. Oh, Carl is not dressed like a gilr in that one. I loove Colin’s suit there <3 Lovely color!